When you have attended 16 straight seasons of Vancouver Fashion Week (VFW), you begin to recognize faces of others who have been there several seasons. This is especially true of the runway. From designers to models - it's a joy to watch them mature from one season to the next as they gain experience. This season I realized there was one beautiful model with soft red hair and pale skin that screamed of Ireland (no idea if that is her heritage or not) - Rachel Sargeant of Leo Management - that I remembered seeing a lot. I have the joy of backstage access at VFW and had the pleasure of saying hello a few times over the last few seasons. Each time I received a warm, friendly smile. It was time to get to know her a little better. A sure sign of Rachel's talent is the sheer number of shows she walked in this season. Booking that many shows is a combination of several things. The designers certainly need models that fit the clothing and have the right look to showcase the garments, but they also want a great work ethic. That means showing up on time (or early), having a smile on your face, being prepared with the right basic undergarments on hand, offering a positive reaction no matter what your are asked to wear or how your make-up/hair is styled, being quick to pick up what they want the runway show to look like and an overall yes attitude. You absolutely have to be easy to work with. Today, it's a chance for each of you to have a photographic peek behind the scene and on the runway with Rachel at VFW F/W15, as well as a Q and A offering a little personal information. Enjoy! Tell me us a little about yourself where you're from, where you grew up, what you do outside of modelling (work, school, interests), etc. I am nineteen years old and have been modeling for about four years now - and still enjoying it! I grew up and still live in a suburb about forty minutes outside of Vancouver. Outside of modeling, I am a full-time university student majoring in English Literature, read an outrageous amount of fantasy books, and write my own novels. A huge theatre kid, I love browsing through vintage shops and anything relating to Marvel comics. I bellydance and horseback ride, can speak French, Spanish, Japanese, Sign Language, and am currently learning Korean. Describe your personal style? How has modelling influenced it? I was a very casual person until I immersed myself in the fashion industry. Modeling has definitely opened my eyes to different ways of wearing clothing and the fashions of other cultures. As for my own style, I would say it’s peacoat-skinny-jean-printed-Tshirt-grunge-flannel. I love my (vintage) army coats and ripped jeans, but also have a drawer full of fluttery skirts and hair bows. I like dressing for my mood. What influenced you to pursue modeling? How old were you? My mom modeled before she had me, and I think seeing her pictures made me curious from a young age. I was around twelve or thirteen when I started developing a real interest, around that time girls start reading teen magazines and watching America’s Next Top Model. I would see the photoshoots and think ‘that looks so fun’ and ‘I wish I could have a picture like that!”. I was fifteen when I had my first photoshoot and am very lucky to have the full support of my parents in my career. I am signed with Leo Management here in Vancouver and love my Leo Family! What is the most enjoyable part of your job? What is the most difficult? As a theatre kid, all the makeup, hair and ‘costumes’ I wear appeal to my dramatic side. I love being recreated and seeing what people can do to change me. The most difficult part is dealing with the extreme levels of competition. You always have to be taller, slimmer, better than everyone else, because there are so many people who want to do this that it is all too easy to be replaced. What your the favourite moment in your modelling career so far? The moment I found out I was going on contract to New York. I was seventeen, it was my first contract anywhere, and it was New York to boot! The excitement of signing that dotted line and the whirlwind planning and packing are memories that will stick with me forever. 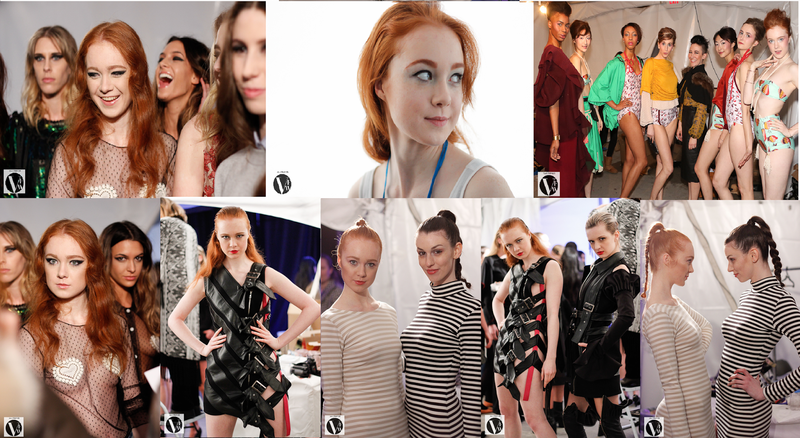 How many season have you walked in VFW and which shows did you walk in this season? This Fall/Winter15 season was my sixth season of VFW, and I ended up walking eighteen shows - Alcoolique (Opening Gala), Grandi’s, Theresa Chen, Alex S. Yu, Connally McDougall, YKS, Dervish Dubai. Pouneh Askarian. Paola Gamero. Sofia. Aniimiism, Noe Bernacelli. Nika Tang. Michelle Lesniak. Fesvedy. Ophelia Song. Alcoolique and Eliza Faulkner. Last season I walked twenty shows, and I would have loved to beat this previous record! What is it like backstage from a model's point of view - especially when you have so many shows? Can you share a funny moment? It can get so crazy backstage, especially if you booked back-to-back shows and have thirty seconds to change full hair, makeup and wardrobe looks! Besides that, it’s usually pretty chill, and all the models I know get along rather well. We play card games and eat our salads together and go on coffee runs between shows. There is a level of competition that is only slightly acknowledged, because of course you want to book more shows than that girl over there, but I’ve found everyone is supportive and shakes off any grudges rather quickly. As for funny moments, I think the best thing about us is that on the runway, we’re these cool, collected, intense goddesses, but backstage before we go on we are all dancing like crazy and being total weirdos, regardless if we have on leather or lace or pearls! Did you have a favourite outfit this season? Hands down, my favourite outfit was the magnificent green beaded gown I wore for Peruvian designer Noe Bernacelli’s show. When I arrived at the fitting I saw it hanging on the rack and thought to myself, “that is the dress for me. I want to wear that one”, and then he smiled, picked it up and told me it was mine! I was so excited. It was beautiful, with a train and embroidery in emerald green. When I walked out on the runway, everyone in the audience started cheering and clapping! I have a Youtube channel (A Model Who's Read) where you can watch fashion show vlogs and commentary on my majestic daily life. Book reviews are also a regular occurrence. I am a model who reads, after all.